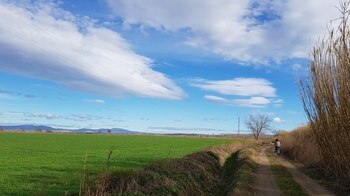 Sobrestany is located at the foot of the Montgrí mountains, but also at the edge of a huge plain with small villages stretching all the way to Roses. The villages are connected with country roads, but fortunately also with numerous dirt roads, which are wonderfully suitable for long bike rides. The tour from Sobrestany to Verges is especially recommended on Sundays, since then the flea market takes place in Verges. In the Fonda opposite the flea market you can order a refreshing coffee and a sandwich. The place is loud and full and many of the clients are the traders from the flea market. Small tip: if you want to eat something, you have to sit down at a table - the counter is only for drinks. 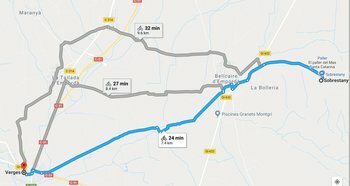 From Sobrestany to Bellcaire you drive on the old road towards Ullà (this avoids the new busy road) to Bellcaire; from there you cross the village and then go always straight on the dirt road, with the water channel on your right. On the way you may meet a tractor, but otherwise it is quiet. Walkers are greeted with a friendly and casual "Déu" (hello). The track is flat, flat, flat, and since it isn't very long, there is hardly any fatigue. But there are longer alternatives, which are indicated on Google Maps. The Tour to Ullà, a village just outside Torroella, is especially worth the time of the Fira de la Poma d'Ullà, when the apple festival takes place there. But also in other seasons the trip is worthwhile especially because of the varied surroundings. 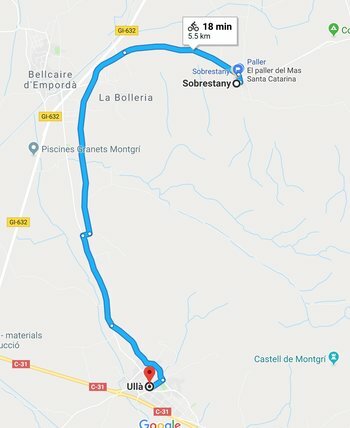 The trip starts from Sobrestany on the small road to Bellcaire and then turns south towards Torroella de Montgrí, past the monastery of Santa Caterina. The road is poorly paved and only occasionally you encounter a car. Towards the end, the road climbs gently.